Wes Tate scored Little Common's opening goal against Mile Oak. Little Common's footballers had to settle for a share of the spoils in a pulsating 3-3 draw at home to Mile Oak on Saturday. Common looked like they had won it when Lewis Hole put them ahead in the 89th minute, but Mile Oak snatched an equaliser in the second minute of added time. 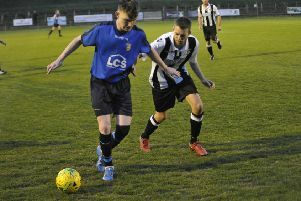 A clash between two of the top five in Macron Store Southern Combination Football League Division One ebbed and flowed one way and then the other before finally ending all-square. Dave Ammoun and Wes Tate returned to the starting line-up in place of George Aston and Adam Smith as Common looked to keep their impressive unbeaten home record intact. The match started at a blistering pace with play switching from one end to the other as both teams made their attacking intentions clear. The Commoners had the ball in the net after just four minutes when Zack McEniry headed into the path of Hole, who fired home only to be flagged offside. Martin Denny netted Common's second goal in the 3-3 draw. Three minutes later Common were ahead. Jamie Crone raced past an Oak defender and delivered a delightful ball across the goal for Tate to prod home at the far post. The visitors were soon level, however. Common's appeal for a foul on the edge of their area was waved away and a ball across the face of the goal was met by the head of Jamie McKenzie. Oak almost took the lead when a defence-splitting pass put McKenzie through on goal again, but Common goalkeeper Matt Cruttwell did well to push him wide as he attempted to round him. Common continued to press at the other end, but could only find the arms of the Oak goalkeeper, with Hole and Crone both seeing efforts saved. Lewis Hole put Little Common 3-2 ahead in the 89th minute. Oak went 2-1 up after half-an-hour when another delivery from the right was knocked in by Jack Stenning from close range via the post. Common created further chances as half time approached, but were unable to beat the visiting goalkeeper. It was Common who began the second period the brighter of the two teams as they looked to get themselves back into the match, but chances were at a premium despite long spells of possession. Oak missed a glorious chance to all but seal the points with half-an-hour remaining, but a weak effort to Cruttwell’s left was dealt with comfortably. At the other end, Martin Denny blazed Common’s best effort over the crossbar after cutting in from the right and McEniry failed to hit the target with a free header. The equaliser did arrive 10 minutes from the end when Russell Eldridge found Crone and his ball across the area was swept into an empty net by Denny. With a draw now looking the most likely outcome, it was Common who took the lead a minute from time. Eldridge’s free kick was fumbled and Hole was on hand to slot home the rebound. There was still time for Oak to grab an equaliser, however, when a delivery to the back post was headed home by Enzo Benn. Common: Cruttwell, Ammoun, Mote (Sloat), Eldridge, Cruikshank, McEniry, Saville, Tate, Hole, Crone (Walker), Denny (Smith).